What is the Qualification of Doctor in Root Canal Treatment? Dr Enatsu was the first dentist from Asia to attend the courses by the world renown endodontist (Dr Stephen Buchanan) who introduced the NiTi files to dentistry and the Microscopic Endodontic Techniques course together with the graduate students at UIC, Endodontic Department. In our clinic, together with our skills to give adequate pain control, we can provide the most up to date root canal treatment in comfort. Root canal treatment involves cleaning out the necrotic and diseased nerve tissues in the root canal system(it is composed of main branches and small accessory branches) and filling the canals.In our clinic, together with our skills to give adequate pain control, we can provide the most up to date root canal treatment in comfort. The saving of useful teeth is worth of our best service. It is strongly advisable to have the initial root canal treatment done as best as it can be as the retreatment decreases success rate, is costly and time consuming. 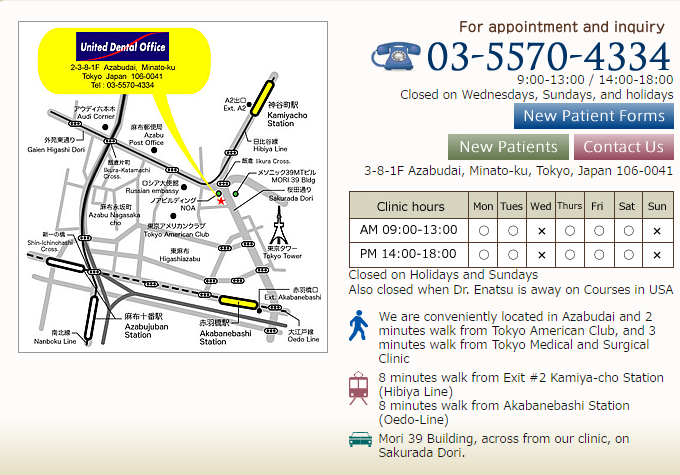 General level of root canal treatment in Japan is not as up to date as what you can receive at our clinic. Our doctor has adequate training to provide the standard of treatment similar to endodontist in US. Dr Enatsu is the first dentist from Asia to attend Dr Buchanan’s course on Microscopic Endodontics in 1999 and had the training at the University of Illinois, Endodontic Department. Patient receives adequate anesthesia so there will be NO PAIN during the procedures. We have patients coming to our clinic, due to inability to get profound pain control during the procedure at other dental clinic. Root Canal Treatment is completed in one or two appointments. We do provide medication to control post-operative pain. Do I really Need a Root Canal Treatment? 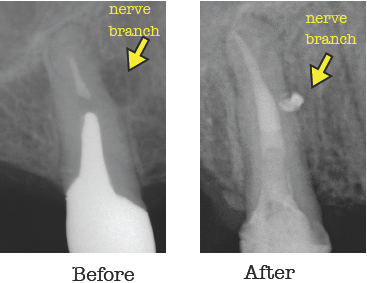 Root Canal treatment is needed when the nerve is inflamed or undergoing irreversible damage/infection. Few factors help us determine if the tooth needs root canal treatment. sensitivity to pressure either from biting, tapping or pushing on the suspect tooth. At least several of the above test should indicate the need for root canal treatment for us to make the recommendation. Accurate diagnosis is important because once treatment begins, you are totally committed. Once treatment begins, it must be completed, therefore; you can not change your mind. When you have pain that wakes you up at night or throbbing pain, you may need a root canal treatment. We will make few test to make sure the diagnosis is right and that you really need the root canal treatment. One or two appointments composed of 90 to 120 minutes are needed to complete the procedure. Clinical Case: 4th canal and curved root. Treatment: Patient had big fillings that resulted in nerve infection. 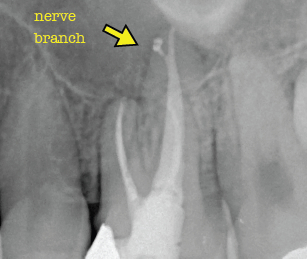 Note the curved root and additional canal (arrow). Patient Testimonial: I went to three clinics before coming to United Dental Office. I finally got the right diagnosis and after the root canal, my pain disappeared! Clinical Case: Efficient cleansing and shaping of the main canal with repair of the external resorption. Treatment: Patient has a painful bite. 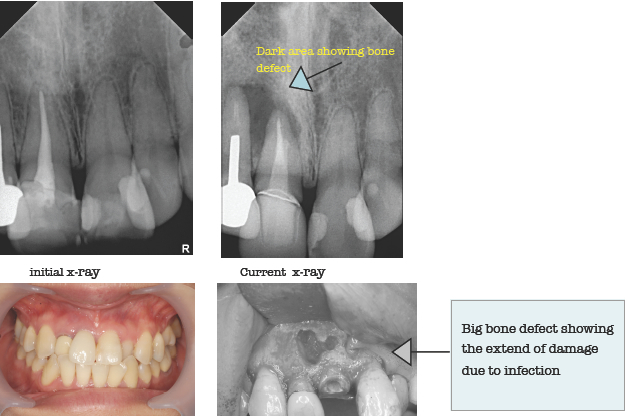 The x-ray showed infection due to the external root resorption. 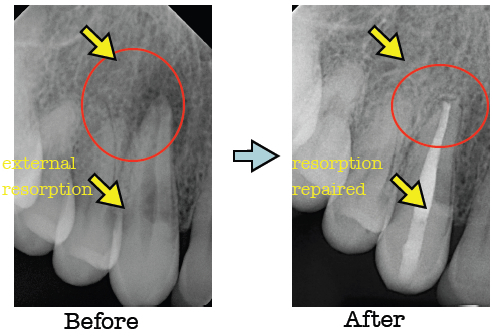 Proper root canal treatment and resorption repair removed the infection. Do I really Need a Root Canal Retreatment? Root Canal retreatment is needed when the initial root canal treatment was unable to remove all the substances that may cause infection. Few factors help us determine if the tooth needs root canal treatment. Swelling of gum, originating from the acute infection from the root canaled tooth. following condition, retreatment is not recommended. Root may risk great damage due to retreatment procedures. Previously treated root canals can get infected. It is because there is still source of infection in the root canal system. Microscope becomes extremely important to find previously missed canals or retrieve separated instruments. Clinical Case: Lack of cleansing and shaping of main canal. Treatment: Patient had big swelling on previous root canal tooth. Crown, post, & root fillers removed. Root canal retreated. Abscessed area (arrow) refilled with bone after 12 months. 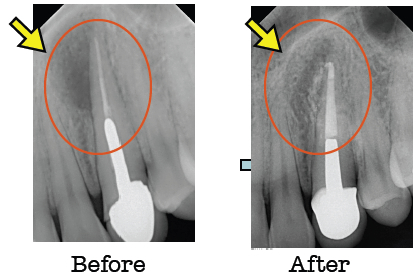 If the infection is limited to root tip and retreatment is difficult, endodontic surgery is an option to remove the part of the root that is source of infection. It takes about 90 minutes under microscope. Case: Infection treated with retreatment and endodontic surgery. Dark area in the x-rays showing nerve branching. Dark infection went away after Retreatment. It is not possible to see the branching just from a regular x-rays. 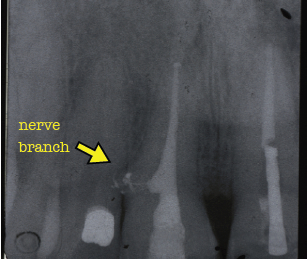 We only found the branching after the root canals are filled with radioopaque gutta percha point and sealants. Branching is mostly around the root tip, but it is possible at the midroot section or even near the crown. cause of infection due to perforated post. Tooth needs to be extracted. Dark area on root tip (Infection) disappeared after root canal retreatment. Note the newly cleansed M2 Canal and sufficiently cleaned distal root canal. The canal where the nerve of the root resides is called root canal. Root Canal Treatment means treating this canal. When bacterial infection in the root canal is removed, the root canal problem is usually solved. However sometimes the treatment is complex and difficult. According to research, the percentage of improvement of shadow around the root disappearing is as follows. It is known that using the microscope will improve the success rate. Condition where Nerve inflammation do not improve, even after treatment like caries removal and fillings. Condition where bacterial contamination in the root is causing inflammation around the root apex. Dental CT may be necessary to determine the shape of the root and/or canal. This will give us more information about the canal during root canal treatment. Negative Vacuum Procedures will be used to minimize the leakage of the Sodium Hypochloride out of the canal. 7. Please take the medication as instructed. If you encounter any abnormalities like rash, itch, or diarrhea, please stop taking the medication and contact us. It can become more painful than before the treatment. Usually the pain can be controlled with pain pills. 0.1% of cases, it can be very painful. There can be more swelling than before the treatment 0.1% of the cases may have swelling in larger area of your face. Rarely, there are internal bleeding around your eye, cheek, or below the jaw. They will disappear gradually from 2 weeks to one month. *Strong symptom seems to appear when physical condition is not at its best. We will take x-rays as you return on routine check up and cleaning.